People forget how many chairs Las Vegas utilizes in the gaming and entertainment venues; consequently, bad chair accidents occur. Chairs and Barstools can break, separate, and may have latent hazards such as exposed steel staples or improper assemblage. Routine maintenance of chairs is often not done as the chairs are in constant use and are rarely replaced until they are in obvious dis-repair. Chairs are present in Buffets, Blackjack and gaming table areas, restaurants, hotel rooms, banquet areas, stadium and events, showrooms, lobbies, and other hotel areas and often become worn out from overuse. Chairs are made from plastic, leather, faux leather, fabric, wood, natural and artificial materials. The glue in chairs can become brittle, the joints can get loose, and the support rails can break causing a catastrophic collapse of the chair. Screws or bolts may become loose causing an unstable chair, which can lead to a fall or injury. Unstable chair legs can make the chair tip or fall upon seating. The wood joints in chairs are usually mortise and tenons, dove tail, or dowel style joints. They should last the life of the chair--the question becomes one of how many people have put this chair to use? 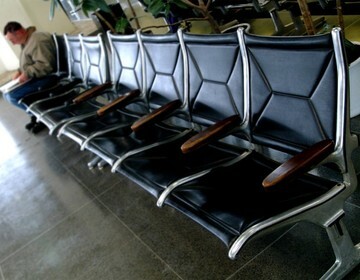 A commercial grade chair is governed by the BIFMA and gives certain strength standards for chairs including leg, seat, and seat cycle strength. The BIFMA is The Business and Institutional Furniture Manufacturers Association, and has set the standard for a normal use chair at 225 pounds and a heavy load chair at 375 pound (believed to be raising this to 400 pounds) with a standard pan width of 22 inches. Our law firm has handled many chair style accidents from barstools to chairs including the complete break of the chair to instability of the chair. Often we make claims against the hotel for the negligent maintenance of the hotel chair, failure to replace and aging chair, or a direct claim against the chair manufacturer for a product's liability case. Injuries range from low back, neck and head injuries, to hips and hands given all the moving parts on some chairs. Hotels often argue the guest on the chair is to blame for the incident as they should have realized the chair was broken before using it, or they will point to the alcoholic beverages consumed as the culprit for the bar stool collapse. Video footage is often available (See Video, Camera, and Digital Tape Recording if it occurred in a hotel or casino). Often they may blame the size of the person arguing the chair could not support the weight. A chair should support If you need a Chair accident attorney or a barstool accident attorney contact the Las Vegas Chair Lawyers at Benson & Bingham. Chairs accidents should not occur, but if you are the victim of a chair malfunction, call Attorney Joseph L. Benson II, Esq. at 702-382-9797.